(Corem, Porac, & Ward, 1984). Occupational therapy addresses dysfunction interfering with activities of daily life. For children, activities of daily life are encompassed by play, school, and home. Child development can be reached through therapeutic play guided by an occupational therapist. Occupational therapists are trained to design treatment plans specific for the needs of each individual child. Our education is medically based including anatomy & physiology, neurology, and human development. What is sensory integration? Sensory Integration is a theory developed by A. Jean Ayres, an occupational therapist. It is based on the assumption that our 7 senses (sight, sound, smell, taste, touch, vestibular [movement & the pull of gravity], and proprioception [information from muscles & joints about body position]) work together to create a sense of self and environment. For sensory integration to occur, input from the environment is taken in through the senses via receptors, then sent through the nervous system to the brain to be processed to create a response. The first step is sensory registration, which is the process whereby the brain becomes aware of new sensory stimuli imposing on it. (For example, looking toward a sudden loud noise when reading the newspaper on the patio) Next, sensory modulation occurs to regulate, adjust, or adapt to incoming sensory information to maintain a balance or to respond to the stimulus (For example, the loud noise is the neighbors lawn mover, that is ignored and kept in the background as you continue reading, but can be brought back to conscious attention if necessary or if changed). A child’s arousal state influences sensory integration as well. Arousal is the fluctuating level of alertness of the nervous system which is extremely affected by sensory input. Our bodies need to be maintained at an optimal level of arousal for learning to occur. A normal sensory system can regulate these levels by reacting appropriately to provided stimulus when arousal levels are low to wake it up or when we are over-aroused or stressed and need to be calmed. Together these areas of sensory integration provide the needed foundation for more complex learning and behavior which would not occur without it. For most children sensory integration develops as the child matures, but for others it does not develop as efficiently as it should. This will lead to challenges in learning, development, or behavior.What is the sensory system? All of the senses work together to create a foundation for higher level skills to emerge including body awareness and motor planning. These skills are required to be able to perform all movements and function effectively in every day life. What does a child with sensory integration dysfunction look like? A child with sensory integration dysfunction may have difficulty with handwriting, playing with toys, performing self-care tasks, or other activities in which children engage. They may be fearful of movement or when their feet leave the ground as seen on playground equipment. Some children may have difficulty sitting still because they are overly active. They may often fall and seem to have no awareness of danger. In each of these situations sensory integrative dysfunction can interfere with academic learning, socialization, and self esteem. Children with sensory integration dysfunction can have impairments in sensory registration and/or modulation of information received by their sensory system. They may also have difficulty maintaining optimal arousal level. What is sensory system dysfunction? Motor Planning/Praxis Dysfunction:Execution problems occur when a child does not have the motor skills needed to complete the action. Muscle tone, strength, or endurance may be the limiting factors.What evaluations are available? If sensory integration dysfunction is suspected, an evaluation can be performed by a certified occupational therapist. Evaluations usually consist of a questionnaire for parent observations, standardized assessment and clinical observations of responses to sensory stimulation, posture, balance, coordination, eye movements, and fine motor skills. The best diagnostic tool to evaluate sensory processing deficits relating to learning and behavior problems is the Sensory Integration and Praxis Test. What is Sensory Integration Treatment? “We can enhance the functioning of the client’s nervous system by providing the client with opportunities to take in enhanced sensory information in the context of active participation in activities that are meaningful to the client, and that elicit adaptive behaviors” (Jean Ayres, 1979). Through sensory integration therapy the brain has the ability to change. The nervous system will then allow for accurate sensory registration, processing, and modulation. This is done by providing the appropriate types and amounts of sensory input during child directed activities. The child is an active participant in fun and motivating activities that are aimed to increase the child’s self esteem. Sensory integration is a movement-based therapy that encourages gross movements in many planes using large pieces of therapeutic equipment (ex. suspended equipment, scooter boards, tunnels, therapy balls, tactile mediums, and vibration, etc.). This equipment promotes movements including flexion, extension, and rotation, movement of the body in space, and movement of the body in relation to objects in the environment. As the child participates in movements, sensory information from the proprioceptive, vestibular, and tactile systems is produced requiring the nervous system to process, organize, and integrate the information. Problems can occur in any of the three parts of motor planning; ideation, sequencing, and/or execution. There are two types of vestibular system dysfunctions; gravitational insecurity and under sensitivity to vestibular input. are characterized by an under-sensitivity to tactile information. This is associated with sensory registration problems. A child with this problem may get hurt and not realize it, may know he is being touch but not know exactly where, or he may not know that an object he was carrying was dropped. It is usually difficult for these children to identify objects by touch without the help of vision. Their hands and fingers may appear clumsy and uncoordinated causing difficulty with manipulatives or writing. Articulation may also be a problem because they cannot feel their tongue in their mouth. There are two types of tactile system dysfunction; Tactile Defensiveness and Tactile Discrimination Problems. Sensory defensiveness describes children that are oversensitive to touch, vision, auditory, movement, taste, and smell stimuli. Children that are over-sensitive to certain inputs tend to avoid them. If they are unable to avoid them they will become over-stimulated or over-aroused and their nervous system will respond by going into a fright, flight, fight mode. The fright response alerts the nervous system to something that is uncomfortable. This leads to a flight response where the main purpose is to eliminate the negative stimulation. This can be subtly done by a facial expression, or it can be extreme where the child runs away screaming. If this does not work the fight response will occur where the child will push the stimulus away or a more aggressive reaction can occur. This is a normal nervous system response to an aversive interaction and the level of the fright, flight, fight response is dependent on the child, the uncomfortable stimulus, the environment, and past experiences. Children that are under-sensitive tend to seek out input from their environment. Their brain does not register typical levels of input so they will often engage in play that is rougher or faster to have an effect. This additional input will feel good and organize them as well as provide them with body awareness. Motor planning occurs in a 3 step process; ideation, sequencing, and execution. First a child will have an idea (ex. Slide down the slide). This is followed by sequential plan of how to move to do it (ex. Climb up the ladder, sit down at the top, then push to slide). The final step is the actual motor act of performing the task, where the child must make their body move accurately to follow the plan. It is difficult for a child to create and execute a series of movements if they are not receiving accurate information from their bodies and the environment due to insufficient sensory processing. The movements will tend to be performed with an excess expenditure of energy and with inaccurate judgment of the required force, rhythm, and amplitude. Motor planning bridges motor actions and cognition and occurs when new movements are executed. Movements that are repeated are learned by our brain and body and become automatic no longer requiring a motor plan. Body awareness is an internal awareness that allows us to know where we are, what position we are in, and how we are moving. It provides information on body boundaries, where our bodies end and the environment begins. Body awareness allows us to move without having to rely on the visual system to guide each movement (How do you know if you’re putting on your shoe if your not looking?). This skill is created over time through many sensory experiences that are stored in our brains. Children who are either deprived of sensory experiences or children who are not registering and processing sensory information accurately do not create this internal awareness, therefore the quality of movement is affected. The tactile system provides information about the environment through receptors in the skin. There are two systems for touch; the discriminatory system and the protective system. The discriminatory system provides information about objects in the environment (hard, soft, wet, sharp, smooth, etc). The protective system alerts us to danger and provides information regarding pain, temperature, and crude touch. The tactile system may be over or under-responsive to touch, affecting a child’s body awareness and motor planning. The vestibular system measures movement and the pull of gravity. It is measured by 2 types of receptors found in the inner ear, the semicircular canals and the otolith organs. Together they detect angular, rotary and linear movement, the rate of movement, and the duration of the movement. The purpose of the vestibular system is to register information about movement and to elicit muscles in the neck, trunk, and limbs to react to the movement to support the body. 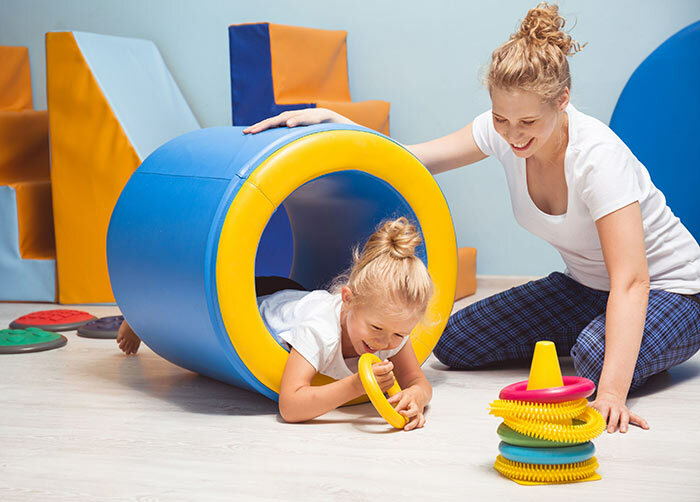 The vestibular system affects a child’s balance, muscle tone, bilateral integration, development of hand dominance, alertness, ability to attend, and the visual system. Proprioception is the perception of movement and position of the body parts in relation to each other. This tell us where our body is and what it is doing. It is measured by receptors found in muscles, tendons, and joints. The purposes of proprioception include spatial orientation, rate and timing of movements, and force and acceleration of muscle stretch, it affects a child’s body scheme and motor planning. Ideation problems are seen when a child does not know how to play with a toy or can only play with toys in the same way (bangs all objects together). Most children will strive to find new ways of playing with things; but these children may not be able to. Sequencing and planning problems occur when children are able to formulate an idea, but they are unable to complete them properly. They are unable to sequence their body movements to complete the task. Gravitational Insecurity is an over-sensitivity to vestibular information. It is an intolerance and fear of excess movement. These children dislike have their feet off the ground and being on unstable and uneven surfaces. They do not like playground equipment or having their head inverted. Their motor skills may be delayed since they avoid movement. Children with gravitational insecurity may also experience car sickness. Under-sensitivity to vestibular information is seen in children that crave movement (ex. swinging, rocking, jumping, spinning, etc). They have difficulty sitting still and often need movement to maintain an optimal level to learn. These children tend to not get dizzy and have poor balance because they cannot feel when they are losing their balance. Eye hand coordination and eye body coordination tend to poor because the connections between the visual and vestibular systems are not strong.